“To protect your health, I think it is time you stop competitive gymnastics,” my coach explained. Sitting in her office with tears rolling down my cheeks, those would be the words that would change my life. My coach said this to me on a warm, blue sky and sunshine Colorado day in early November. It was the type of day you could clearly see the peaks of the Rocky Mountains from every vantage point around campus. However, that perfect day would be the day my life as I knew it shattered, and I was left collecting the pieces. My career ended when I was 19 years old, two and a half years too early. It was unexpected, premature, and it hurt like hell. It would take me years to get over the loss of having my dreams ripped away from me by a body that failed me - a body I’m still trying to appreciate, love, and trust once more. My parents put me in gymnastics when I was two and a half years old. By age six, I was competing at the state level and by age nine at the the national level. Gymnastics soon became my whole life. Throughout the school year, I spent five hours a day, six days a week training; then during the summer, I trained seven and a half hours a day. I strived every single day to get stronger, hoping to not only better my skills, but to also perfect them. I have never been one to give up, and when I trained I was never one to end the day on a bad note. But, gymnastics also gave me something that is more intangible than hard work, dedication, and the drive to perfect each skill down to the toe point. It gifted me with a freedom that I have only ever felt in the gym, an exhilaration that is like no other, and if even only for seconds, the ability to fly. One day, when I was thirteen I was training a new uneven bars dismount and I was to only do 3 repetitions for the day, since it was such a new skill for me. I remember clearly how my third dismount felt. I landed on my feet, but then continued to roll onto my back; I knew I was so close to perfecting the landing and I knew exactly what I needed to do to fix it. So I went up for a fourth, one more than I’d planned for, with a determination to land the dismount perfectly. However, when I planted my feet, my body continued to twist. I heard a horrific pop followed by unimaginable pain. I crumpled to the mat. I had torn my ACL and meniscus for the first time; the first injury in a career intermittently plagued by injuries. Surgery and recovery followed, and I was back and ready for my next season. Through hard work and dedication, I was performing at a higher level than ever before. After losing that sense of flying, I cherished it even more when I returned, and I knew I never wanted to lose that feeling again. I continued to excel throughout my career in high school, and I was extremely lucky to land a full scholarship to the University of Denver for the Class of 2011. Being a part of the University of Denver gymnastics team was a dream come true. I now competed with a team instead of on my own, which added a new mental component I hadn’t previously experienced. I now had dreams and aspirations of competing all around (all four events) for myself, but also to help my team get to the NCAA National Championships. Looking back, there were maybe some freshman year, non-athletic choices I shouldn’t have made, some that I still shudder thinking about. However, when I was in the gym, I was calm and focused - I wanted success and was going to stop at nothing short of accomplishing it. My love affair with gymnastics was as strong as ever. In the gym I lost my frustrations, my homesickness, and my struggles. The gym was my escape. In October of my freshman year, I landed a skill in a deep squat - something I had done a million times. But for some reason, this time was different. Nothing hurt, but I could not move my knee, the same knee I had had surgery on when I was thirteen. That day, I learned that a piece of my meniscus had torn and was caught in my joint. This surgery, surgery number two, happened at an extremely inopportune time. My first collegiate gymnastics season would be starting in just over two months and I was determined to be ready. I took two weeks to rehab, and then I was back in the gym focused on making lineups. And I made it. My collegiate debut was on floor, despite the event being so hard on my barely healed knee, and I competed floor for much of my freshman season. I will never forget the moment that I first competed - I was so proud and so happy to make it to that moment. All of the heartache and hard work had paid off, and I knew for certain that this was just the beginning. My floor routine was set to an Aerosmith medley and I was able to, once again, fly, to defy gravity, and to leave all of my hardships and worries on the ground far below me. The knee pain continued and affected my training throughout the season requiring multiple cortisone shots just to get me through. I worked as hard as I could on a body that was failing me, but never as hard as I wanted. I spent hours in the training room for treatments and those dreaded ice baths. Despite the pain and the work it took just to keep me going, I still loved gymnastics unconditionally, and I was still able to scrape up success. I ended the season as the first gymnast in the history of the University of Denver to compete a “Full-in,” a skill that consists of a double backflip with a full twist in the first flip. (Of course, at the time, it was difficult for me to grasp how incredible of an achievement this was because I was so focused and overwhelmed by the disappointments and the pain). The season also ended with my team qualifying to the NCAA National Championship, which is an experience that I was thrilled to be apart of and will remember for the rest of my life. Furthermore, I ended the season with aspirations for a healthy and strong sophomore season. All of these accomplishments meant almost nothing to me when my dreams to continue achieving greatness came to a crushing halt the spring of my freshman year. Off season, optional workouts had started in May, and I had taken time to get my knee healthy. I returned to the gym with a fresh attitude and the desire to do and be better. However, while practicing some uneven bars drills, I tore my other ACL and meniscus. The feeling was not new. I screamed; a scream of absolute defeat. I called my Dad from the training room crying. He told me he thought it was time to retire, that this wasn’t worth it anymore. As he is a hall-of-fame coach and former collegiate and professional cross-country runner, I knew I should trust his advice, but I just couldn't. He understood how much athletics meant, because he had gone through this transition himself. But in my mind, it was not time and nobody could convince me otherwise. I knew I could come out of it and be successful; I’d done it before and I knew I could do it again. So came surgery number three in June following my freshman year. That summer, I trained, rehabbed and conditioned hard. I went to physical therapy five times a week, worked on knee specific exercises at home multiple times a day, and went every day to my former club gym to do absolutely every upper body exercise possible. I went back to school in August with a plan to be ready to practice by Thanksgiving; I even kept a journal of my progress and my weekly goals. My comeback and my redemption consumed me, I was obsessed. Not only was gymnastics my life at this point, but recovery was all I cared about. I met weekly with our sports psychologist and our nutritionist. And it worked! I was coming back faster than I could have ever imagined. However, I realize now that I was coming back too quickly. I re-tore my meniscus that October. Mentally, I was still not ready to give up, but going into my fourth surgery, my body was and had been giving up on me over and over and over again. In November, I met with my coach who sat me down and told me she thought it smart for me to medically retire by way of NCAA medical disqualification. She told me the team surgeon had also recommended this. My first thought was absolutely not. I looked her in the eyes and told her that I could not do it, that I had to keep going. I knew I could get better and be better. As I said this, my heart was breaking and tears filled my eyes. It felt like I was being punished for something that was out of my control. But the more she talked to me, the more I could see where she was coming from. She gave me a glimpse of life that was so far in the future, I had never considered it. She talked to me about my ability to live a full life as I got older, to run around and play with my future children and to have the ability to live a healthy lifestyle. I did not know at the time how much I would come to appreciate this advice. After a lot of tears and phone calls with my parents, I decided it was time to step away from competitive gymnastics. It was time for my lifetime of dedication to come to an untimely end - and without it, I had no idea what came next. Nothing prepared me for the time “after” gymnastics; the wound left by the too-soon end of my career. I will admit, I was extremely lucky to be medically disqualified and able to keep my scholarship and stay with my team. However, I felt like an outsider, like someone who would never belong in that gym ever again. I felt like I had no one to turn to who would understand what I was going through. Looking back, I realized I went through a significant depression. I cried almost every night for a few months. I tried to keep a smile on my face, but the pain I felt was too much. In addition, I was thousands of miles away from home, and I missed my family more than anything in the world - I had lost my grandma to cancer that past summer and my mom was battling Multiple Sclerosis, so things just kept piling up. I couldn’t escape hardship, and where gymnastics used to be my escape, it was now, to some extent, my prison. I tried to fill the hole left by gymnastics with schoolwork, a relationship, and parties. I continued to use the resources provided by the University, meeting with the sports psychologist and our nutritionist. However, nothing worked. I excelled in school, but took little joy from it. The relationship I was in was unhealthy, and the parties made me feel worse instead of better. The only thing that truly healed my wounds was time, my family, a few great teammates, and a coach who cared about me regardless of my ability to provide results in competition. Those teammates have became lifelong friends who I continue to rely on each and every day. Day by day, things continued to get better, but throughout the rest of college, something was missing. 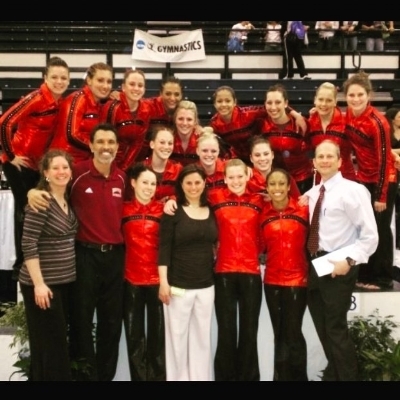 It was during my first year of medical school, when my grades were suffering no matter how hard I studied, that I realized I needed to find another outlet to release my frustration and stress - something that could finally help me begin to heal the space left by the loss of gymnastics. I decided to try running, and while I had tried it before, I thought this time might be different. Yet, no matter how hard I tried, I couldn’t run; it hurt my knees too much. I would go all out and then not be able to move the next day. Due to my Dad’s expertise in the area, I asked him for advice. He told me to make a plan, build up slowly, and stick to it, and it worked! My grades in school quickly improved with running as an outlet. Not only that, but my competitive spark was reignited. This time, the competition came not from judges’ scores or NCAA tournaments; instead, the competition was truly me against myself. With each step forward, I have found an entirely new way to fly. I have since run multiple half marathons and a full marathon, with many more on my agenda. I continue to get faster and stronger, and strive to be a better version of myself each and every day. Once my medical residency is completed, I plan to use my running to help raise money to find a cure for Multiple Sclerosis through an organization called MS Run the US. 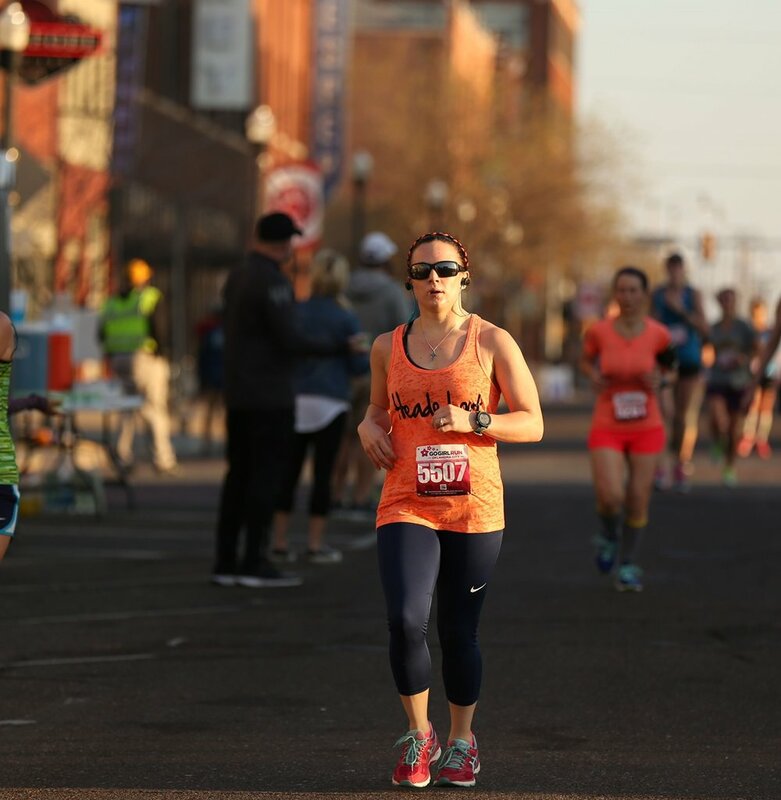 MS Run the US is a relay that spans from California to New York each year, where each runner is assigned a segment, and the segment consists of running a marathon six days in a row. I absolutely cannot wait to take part in this! While the way I had lost gymnastics left such a bitter taste in my mouth, I know that if I had stayed in gymnastics, I would never have found this new passion, and I would absolutely not be who I am today. I want you all to know that I am sharing my story because of how alone I felt in the moment that gymnastics was taken away from me. I didn’t know who to turn to, and I couldn’t find anyone who would truly understand. I know there are so many of you out there. Athletes whose careers were cut short just as their dreams were coming true. You are not alone. I know your pain. I know how it feels to wonder if you will ever feel normal again. I am here to tell you that you will. I am here to tell you that the other side is more beautiful than you could ever imagine. I know you may not be ready to hear this or you may not be able to believe me just yet. And you know what? That’s okay. The pain you feel is entirely normal. It is a sign of losing something that you have been passionate about for most of your life. Take your time, feel the loss, but remember your sport and your career will always be a part of you and that is something that no one will ever be able to take away. Be proud of your achievements, even if it is after the fact. I mentioned earlier that I was too overwhelmed with the defeat at the time to be proud of mine, but today, I am extremely proud of those achievements and I will always have that joy. Stay strong, find what makes you happy and do that. The same attitude that made you a top athlete will guide you in the next chapter of your life’s successes. Always strive to be a better you. Danielle is currently a third year OB/GYN resident in Oklahoma City, Oklahoma. When she isn’t in the hospital, she loves filling her free time with her husband, Caleb, and dog, Bailey. She loves long-distance running, hiking, camping, and traveling. She is currently an ambassador for MS Run the US and is spreading awareness for multiple sclerosis through running. She is training for a marathon with her best friend in January. 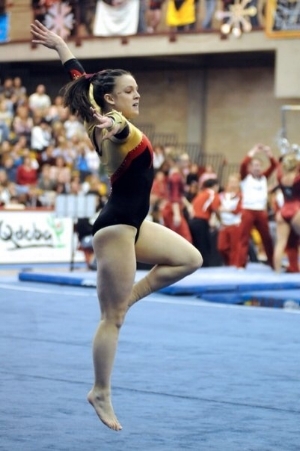 Danielle is a graduate of the University of Denver gymnastics team. DISCLAIMER: Content on this website is provided for general information only.